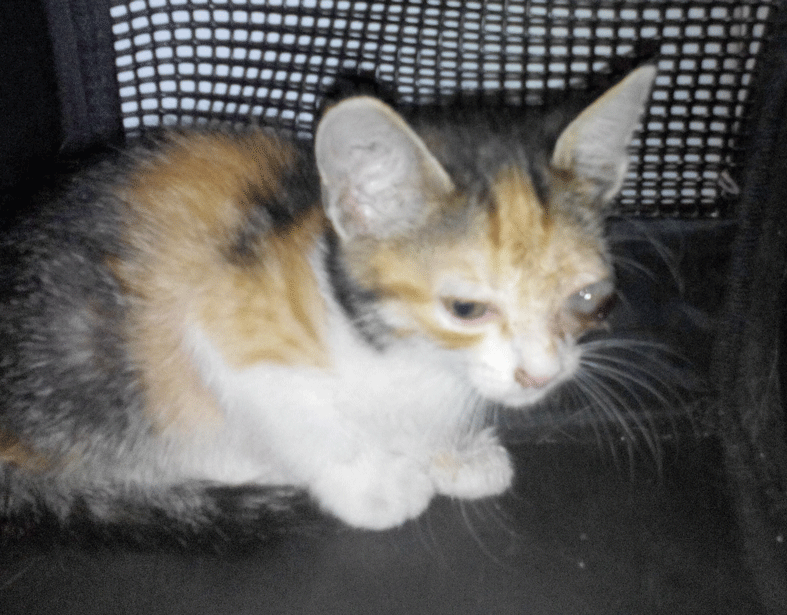 On Monday (15th) morning this tiny bin cat was found collapsed in the middle of the road. He was in a really bad way and after a speed breaking run to the vet, the worst was confirmed. He was infested with worms, fleas and maggots. Bleeding from the mouth, emaciated, swollen infected eyes, severely dehydrated, in liver failure and suffering from hypothermia. We still have these gorgeous kittens from last years rescue now about 5 months of age who need a home, can anyone give them the stability and love they need. 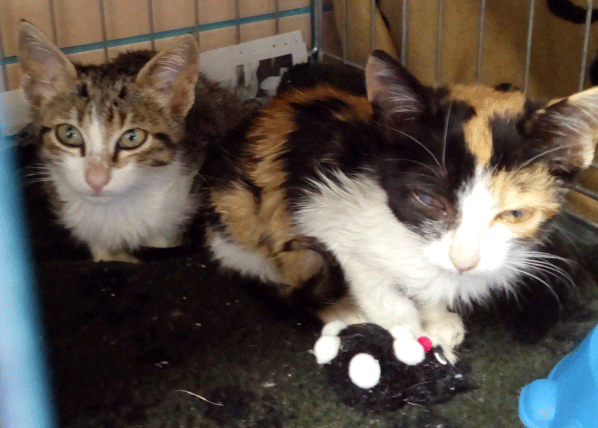 Abandoned on a roadside emaciated, pneumonia from cat flu anaemic from parasites they where 12 weeks of age. Rosie is a dainty lap cat all she wants is constant affection and cuddles she cradles into you and purrs a gentle little creature. Her right eye had a corneal ulcer now healed the eye infection scarred her pupil but she can see fine & can be an outdoor cat. Her coat is a glorious tortoiseshell colour, soft and shiny now. More affected than his sister he took a while to trust humans now talks and purrs he loves cuddles but is shy. 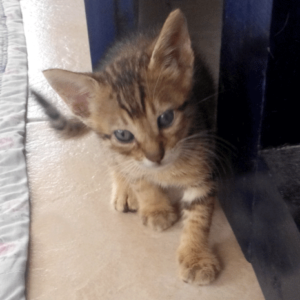 Beautiful tabby markings with long legs he may be a big boy when fully grown. All our kittens are treated for infections/illness, vaccinated, neutered, and can have passports. 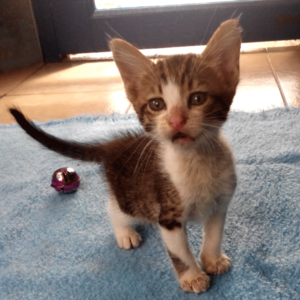 If you can adopt from anywhere in Europe please contact us. 17th February 2016: Today Belle has had her ear mites treated, ears cleaned, face washed & her eyes continue to be treated. She is putting on weight and has begun to take a great interest in eating. Sadly she remains very timid and is easily scared, loud noises or strangers cause her distress. 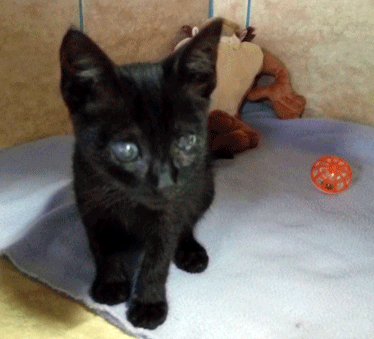 Last week the local Mayors office called to ask if we could take in a cat they had found in the bottom of their bin. We see many cases of abuse & starvation it is nothing abnormal but what arrived was pitiful to see even by our standards. 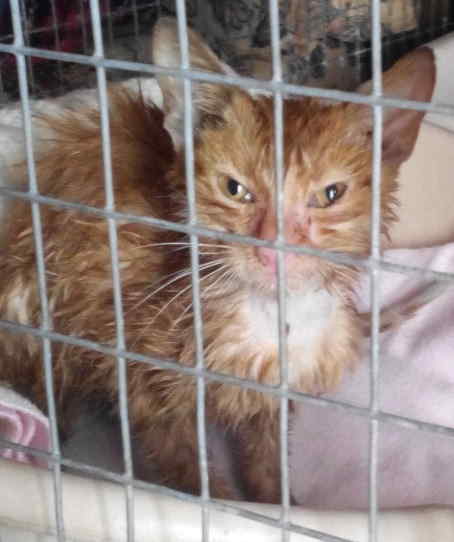 Emaciated unable to stand or walk she had sat in the freezing cold covered by rubbish all manner of foul things, the smell from her was awful paws were black her eyes full of pus she was covered in diarrhoea. The bin lid was down, the condition she was in was so poor she could never have climbed in herself we assume some contemptible human being decided she was disposable & threw her in the bin. Our vet kept her for IV drips/antibiotics/X-rays an FIV/FeLV test which to our surprise & relief was negative. Sadly her pelvis has been broken with many fractures her left hip dislocated, with no obvious veterinary care all her fractures have healed incorrectly a patchwork too late for us to do anything about. The agony she must have been in after the accident while trying to find food & shelter is indescribable. Despite all this she purred, wanted cuddles stoically sitting in her bath water while we tried to remove the caked on dirt. Belle has a long road ahead once normal weight she will need an operation on her back leg we cannot leave it hanging out she might lose it but we will try to realign it first. We are aware this time of year is not good for most financially but we have to try on her behalf for donations towards her veterinary treatment, orthopedic operation & travel. Belle will never be able to be released back to where she was found & will be sent to Woodland Nook in the UK for re homing, many thanks for their efforts in fundraising. In the meantime its rest, warmth, food & meds with love & care. 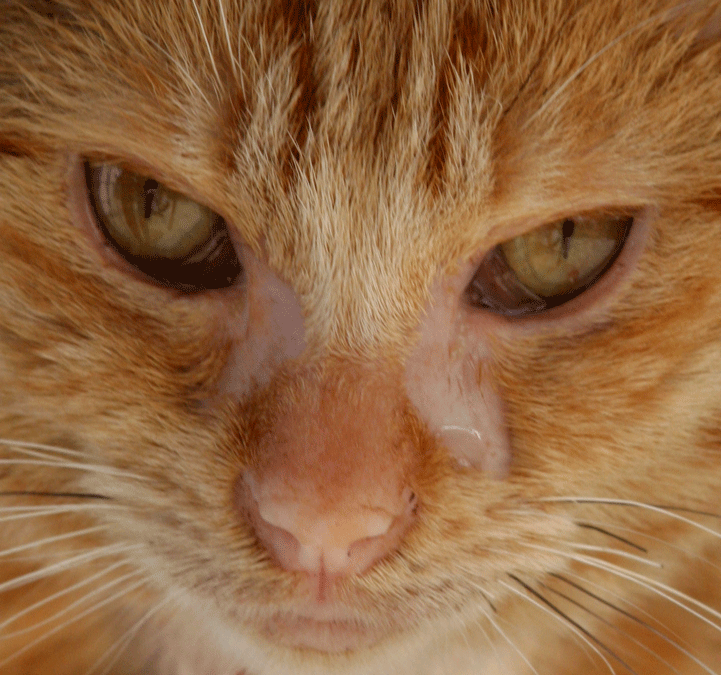 Tilly’s rescue has been traumatic for all involved you may find some of the photos distressing. A male tabby (@11 weeks of age) already blind he died fitting the afternoon we brought him home probably meningitis from the eye infections. At this point we persuaded the gentleman feeding the mother that this cycle had to end she needed urgent neutering. 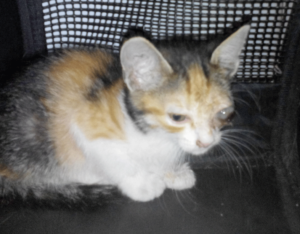 The mother has now been neutered cared for afterwards by the person feeding her & returned to her street, our vet kindly sharing the cost of neutering. Following week the remaining sibling was caught, already lost one eye to infection the other remained just beginning to succumb to infection. 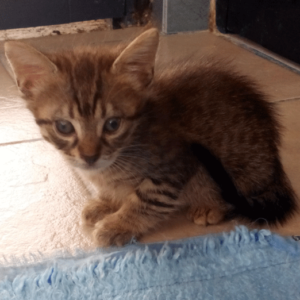 We took her for nursing we did not expect her to live but she was stronger than her brother, fluids, antibiotics treating all the infections & then parasite treatments she is now thriving! 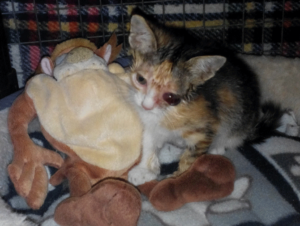 Tilly requires an operation to remove the left eye when she has grown in about another month, all her infections have gone we have started her vaccinations she will also be neutered. Such a special little one she is courageous, clever running all over the place playing trying to catch flies her right eye seems to have normal vision. Tilly adores human cuddles an adorable kitten she can go to a new home now under supervision here or after her operation. 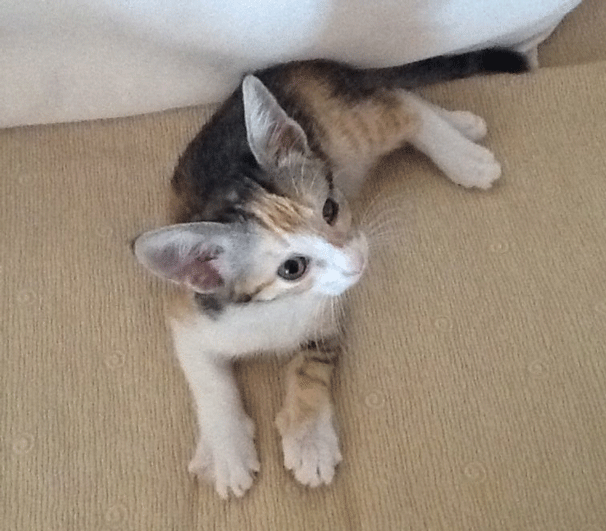 If you can give this amazing little creature a home here or in Europe please contact us.